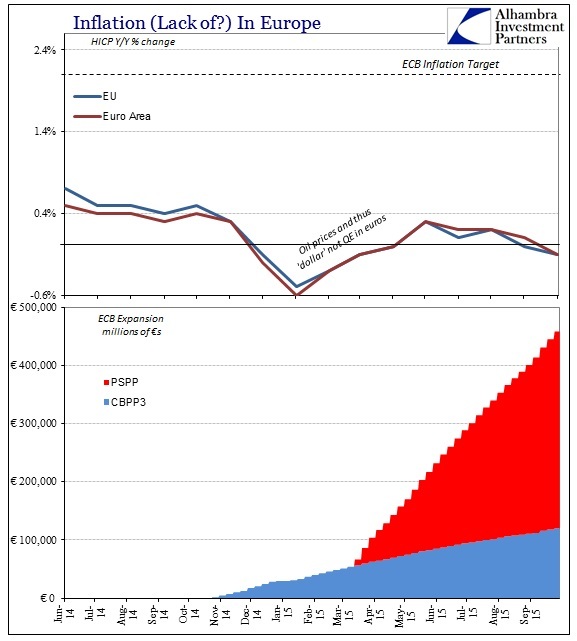 While on the other side of the Pacific economists try to decipher what China has truly gotten itself into, over the Atlantic the Europeans are admitting that trillion is again not “enough.” As I have written repeatedly, the adjectives attached to QE depend on the tense. Ahead of time, peering into the unwritten future, QE “will be” powerful and able, an unparalleled monetary “stimulus”; in past tense, QE was not quite enough, needing always more. It’s damning in two ways, just on the face of it dispelling this insidious notion that any central bank has raw “money printing” power or that would do much good, but mainly as a direct rebuke against orthodox monetary theory that suggests so much respect for itself as to be “quantitatively” precise. How quantitative and “scientific” can it be if it always gets bigger in repetition? The realization of those factors should over time scatter all the thoughts and perceptions about “stimulus.” Yet, they do not seem to as time and again the lack of results is almost universally cheered. Markets are not markets but pets, except in the extreme circumstance, like August, where the illusion comes clean. Draghi’s remarks “exceeded expectations for dovish rhetoric,” said Piotr Matys, emerging-markets currency strategist for Rabobank. “As it goes, it seems the market has quickly adjusted to the idea that December is now what’s considered a ‘live meeting’,” said Christopher Vecchio, a currency analyst with DailyFX. While the ECB’s asset-buying programme appears to have thawed the eurozone’s credit markets, growth remains lacklustre and inflation has fallen back into negative territory. The ECB president said the outlook for inflation was now “less sanguine” and warned of the risks emanating from emerging markets, notably China. I am not sure how you might describe Europe’s credit markets as “thawed” (see below), but as the FT notes QE’s influence is greatly felt in asset prices. Government bond yields fell sharply, with the German 2-year yield (the word should be in quotes given the bund’s price) at -32 bps, and even Italian 2-years experiencing negative “yields” for the first time ever. All of that is “stimulus”? Where? By every count, Europe’s economic condition has violated repeatedly monetary theory and philosophy. From “inflation expectations” to “portfolio effects”, nothing has shifted Europe out of its rut, a zombified Japanese-type existence where manic celebrations break out over 1% annual growth and the unemployment rate falling a little every three months. This is not recovery so much as direct absence of contraction; but the absence of recovery almost assures, at some point, renewed contraction. 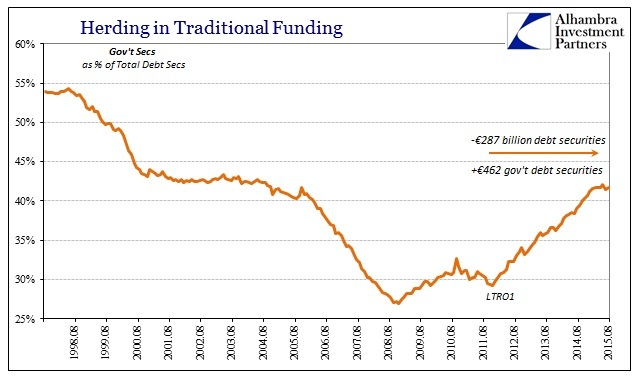 In that frame, QE is the worst of all options since it wastes time – piling up years (and bubbles) now. 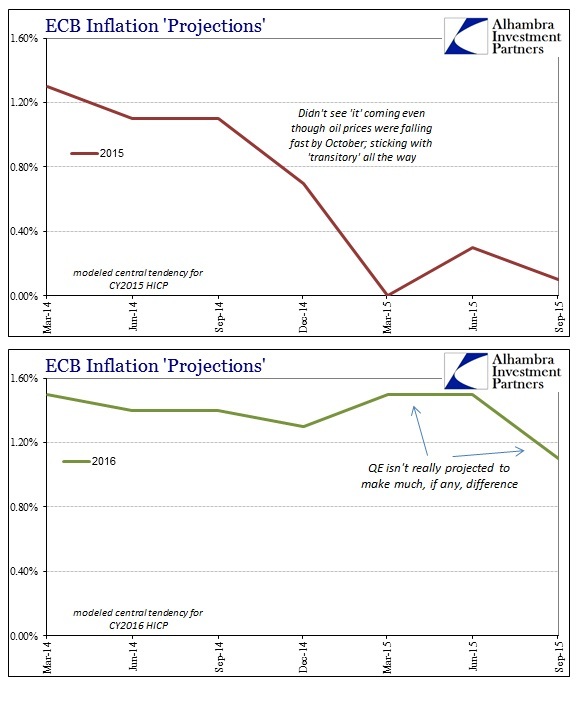 At this point, the ECB might as well go further into the trillions and negative nominal settings maybe even to just break money markets entirely. 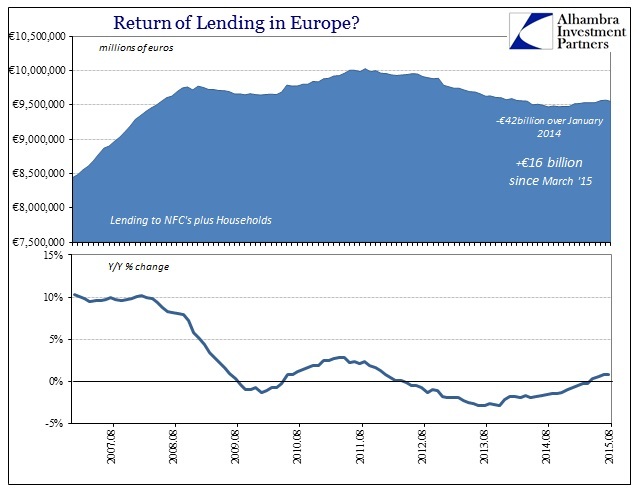 After all, a negative nominal rate is now just the regular business of euro banking. 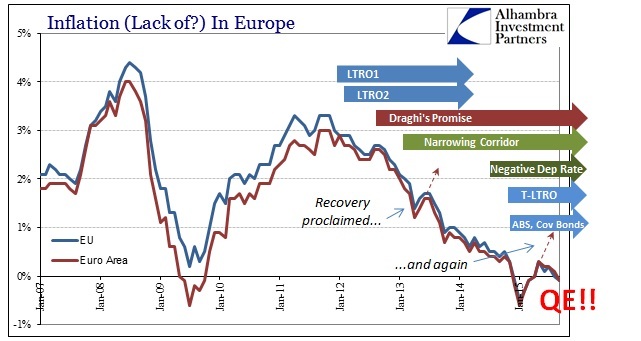 If going down this road is the only way to fulfill Draghi’s promise, then they might as well get something useful out of it such as “quantitatively” figuring out where exactly the terminal level of convertibility might lie. Money markets are supposed to extend greater financial efficiency in order to engender economic transmission, but it is clearly and certainly not in Europe. 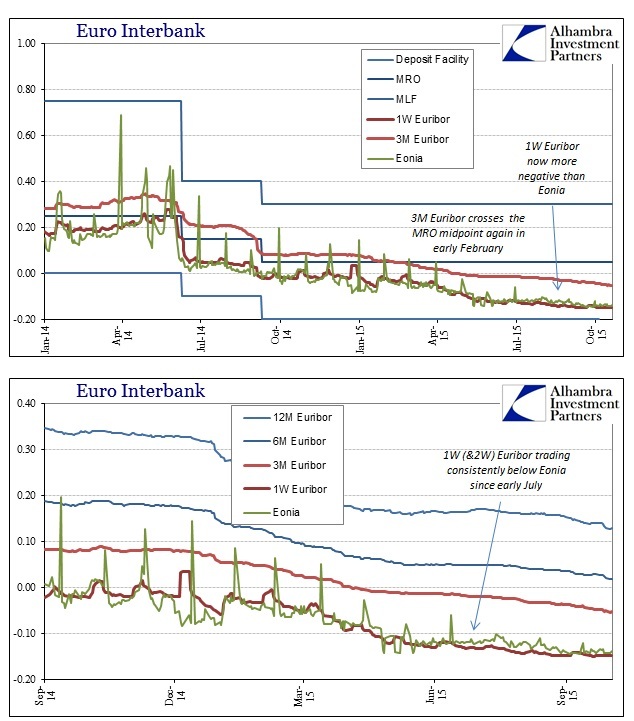 To get something out of QE, then, they might as well figure out the limits of negativity in such a detached format, since money markets are unrecognizable in Europe anymore. There would be another useful benefit if central banks and their economists were not so ideologically committed. Europe, as Japan and the US, is further proving econometrics wholly unsuited to real world applications. The models aren’t just badly calibrated, but plain bad. But it is from them that “markets” glean the positive and hopeful future, forgetting always the costly time and distance lost in still yearning this way. Japan is on its third lost decade, Europe and the US nearing completion of their first outright. The only constant through them all is “stimulus”; the process and results the word signifies can never be found but here it remains. QE breaks money markets, broken money markets thwart economic expectations, so therefore more QE? That “logic” defines only the quantity of lost time.